WWII ORIGINAL GERMAN ALLY OFFICERS SILVER CIGARETTE CASE w/ROYAL MONOGRAM. 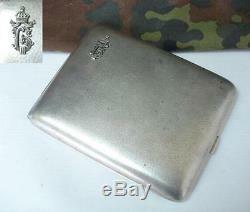 DESCRIPTION: Offered to you is this Very Rare original WWII German Ally officers silver cigarette case. 800 grade silver with Royal monogram on the lid. The monogram with the letter B stands for Tsar Boris III, who was the ruler of Kingdom Bulgaria, a key German ally during the war. Rare and highly collectable item. Thank you for your patience and understanding. They are in no way advertised, recommended or authorized to be used as medical equipment today. TERMS OF SALE: - All items are guaranteed genuine and as described. We always reply to emails within few hours. If for some reason youre not getting response from us, the reason might be messages getting lost in Spam folders etc. Last but not least is the issue of feedback. The item "WWII ORIGINAL GERMAN ALLY OFFICERS SILVER CIGARETTE CASE withROYAL MONOGRAM" is in sale since Sunday, September 15, 2013. This item is in the category "Collectibles\Militaria\WW II (1939-45)\Original Period Items\Germany\Personal, Field Gear".